Pres. Debbie Thomas opened the evening by warmly welcoming all 69 signed in guests to our annual Christmas Potluck. She began the night by introducing Morgan Yurcich, our new high school volunteer who will be helping DHS with all media at the Program nights. Deb Z then lead the singing of O Canada and Steve Elgersma eloquently said the blessing before dinner. Just before everyone lined up for the wonderful potluck, Deb Z explained how during the meal, everyone was encouraged to look at the beautiful photos in the Photo Contest, and how to vote during dinner. Also, everyone was encouraged to purchase tickets for the penny sale, the draws would take place later in the evening. During dinner everyone was welcomed to enjoy the cider tasting from Bain’s Road Cider Company. Geoff McDonald owner/operator would speak later in the evening. At 7:14 AGM called to order by Pres. Debbie Thomas. New Life members Jan and Regina Loots, Mary Lou Johnston, and Hellen Edl were recognized.Continuous service pins were given out to Jim and Sandra Gill, Eric Hunter, Rob and Sandi Marr, Bev and Wray McLean, Jim and Gerda Smith for 5 years and the 10 year recipients were Pam Blanchard, Kim Christoff, Barbara Davis, Maureen Jones and Gwen VanNatter. Minutes from November 15, 2017 AGM were read, and Betty Ballenger and Bev McLean motioned to approve the minutes. The annual financial report was given by Treas. Kim Christoff, who also thanked Lorraine Stevens and Joan King for auditing DHS books for 2018. Kim Dickie and Joan King volunteered to be auditors for 2019. Out going Pres Debbie Thomas gave an overview of 2018. Followed by heartfelt words of gratitude to all DHS members for being the Life blood of DHS, and to the DHS Board for being the Heart and Soul. Deb Zynomirski and Kim Christoff on behalf of DHS, thanked Debbie for her service, spoke of the many things DHS accomplished during her term and gave a parting gift. Installation of 2019 Board of Directors followed. Officiated by Linda Olssen, Executive director from Dist 9. The 2019 DHS Executive is: Deb Zynomirski (President), Debbie Thomas (Past President), Kim Christoff (Treasurer), Petra Kruis-Daly (Recording Secretary). Board members: Denise Richardson, Wray McLean, Lynn Loney, Marilyn Stavinga, Nelly Engelage and Gloria Hunter. Deb Z officially took over duties as President, and assisted by Debbie, they drew the penny sale draw winners for the amazing donated prizes. Deb Z encouraged everyone to support all the local businesses. Dunnville Paint & Decorating (Doris Thompson), Harmony House (Darlene Buscis), Durants (Larry Page & Peter Zyrominsk), Heatherton’s Florist (Debbie Thomas), Bob’s Place (Marlene Link), LVW Creative Barracks (Marilyn Stravinga), Uncle Bob’s (Cindy Huitema),Houser’s Automotive (Debbie Thomas), Pothos Restaurant (Larry Page), House of Plus (Marilyn Stavinga),KFC (Mike Draastra), Towne Café (Wyn Overend), Bev Mclean Glasswork (Cindy Huitema & John Wilson) Stephanie Hair Care (Gloria Hunter), Debb’s Cuisine (Beth Powell), Rexall (Charlotte Huitema), Giant Tiger (Charlotte Huitema), A & W (Doris Thompson), Sweet Retro-Spect (Marlene Link), Blooming Designs (Donna Cavers), Dunnville Vet (Kim Christoff), Lang Calendar (Nelly Englege), Grand Wellness (Bev McLean), Gospel Lighthouse (Ellen Guenther), Ruffins (Susan Milligan),Grand Erie Hardware(Bev McLean), Grand Erie Garden Center (Pat Phillips), Sparkle Ladies Boutique (Michelle Zynomirski), Canadian Tire (Jan Loots), Good Looks( Bev McLean), Katrina Schmitz art (Linda Olssen). The evening’s Penny sale made $425. Gloria Hunter announced the winners of the 4 season photo contest. Summer- Cindy Huitema, Fall-Nick Huitema, Winter-Gloria Hunter, Spring- Deb Zynomirski each received a gift certificate donated from Small Dimensions. Deb Z closed the evening reminding everyone to take their food and containers home, to drive carefully and have a wonderful Christmas. 2. Check out the back bulletin board to see new business and other information. 3. Deb Z thanked Mary Fretz, Donna Cavers, Dorothy Minor and Agnes Wolters for the snacks for this evening. Hellen Edl, Sharon Sykes, Letha Burden, Pat Henderson and Kim Dickie are scheduled for June’s Program. 4. The Lions Home Garden and Craft show. Thank you to all who came to visit our booth, it was a great success with the volume of visitors and the mini demos from Lester F, Kim D and Marlene L. Thanks also to all the people who helped ‘man’ the booth. Those friendly faces were great ambassadors for our organization. 5. Plant sale report by Petra, despite the rain, we had a great turnout of donated plants and friendly volunteers. We ended up making $1851 including the leftover plants sold tonight. 6. Planting Day is May 26. Everyone is welcome to come 8am to help plant flowers to make our town look great. Come to the bridge parking lot and you will be guided to a flower bed to help plant. All annuals are donated by Konkles Greenhouses. 7. Junior Gardeners program has 25 signed up. Our second year partnering with Haldimand 4H. As part of the program the children help on planting day and clean up day, as well as planting and maintaining their own home garden under the direction of Margaret Bottrell. 8. The Members Only Free Garden Tour is on June 16 10am to 3pm. Please make sure you pick up a map/list. Feel free to come and check out all the great gardens. Rain or Shine. This is self guided so feel free to wander and admire. Feel free to bring a friend, they just need to purchase a membership at one of the gardens and they can enjoy. Website will also have details. 9. Plant and Bake Sale for Haldimand Hort Saturday May 19 Rain or Shine. St Paul’s Church, Caledonia. 11. Our condolences to the family’s of two DHS members : Geoff Johnson and Dorothy Egger. 12. Weeders this year are to make sure they received an email from Deb Z with instructions. Weeders are encouraged not to break up the soil, just pull the weeds as this reduces the amount of weeds self seeding. Please remove the weeds from beds and not leave them on the sidewalks. This year we are going to leave any Milkweed that should sprout up, to help the rebound of Monarch Butterflies. 13. There are 17 beds that require weeding this year, many have annuals but some have a variety of perennials.The large flower pots throughout downtown will increase to 32 this year. The BIA provides the summer inserts, DHS decorates for Winter/Christmas to keep the town beautiful. Several community groups have volunteered to help our club weed some of our beds. The local Scouts/Cubs are taking care of one bed, and another by Community Living. The flower bed under the anchor has been redone. Two Tonne of potato stone has been added over new garden cloth, the weeds will no longer have a chance. Thanks to Ed Zylstra from Dunnville Silo for volunteering his time and resources and taking care of this project. 14. Break announced, everyone was encouraged to get a snack and drink, and purchase ways and means tickets before our speaker begins. 15. Deb Z introduced Carla Carlson from Niagara Nature Tours. She had been intrigued with nature her whole life, and had completed degrees in this area. Her topic tonight was on identifying weeds…. Good and bad. 16. Deb Z thanked Carla for her very informative talk. We will all go home trying different plants in our meals, have a new outlook on things that grow around us that we didn’t plant, and have a healthier respect for all plants and how they interact with animals, birds, bees, insects and ourselves. 18. Debbie closed the meeting tonight reminding everyone that Carla is still available for questions about talk and if you give her your email your name will be entered in a free draw. 19. Meeting was adjourned at 8:35pm . Ways and Means followed. Housekeeping, importance of sign in sheet followed. Heartfelt words of gratitude on behalf of himself and Haldimand County to DHS membership for all their community contributions, their hard work, the special projects and beautification of Dunnville. Sharon Slack Pres. of Haldimand Horticultural Society was in attendance to night, and thanked for attending and bringing along information on their up – and -coming Seedy Saturday. It was mentioned that DHS and Hald Hort share some members, and the importance of sharing information and having a strong relationship as both societies represent Haldimand County residents. DHS business was kept to a minimum tonight, highlighting the Silent Auction for gardening books, Early Bird membership draw, Ways and Means table, Volunteering opportunities available within the society. Volunteer sign- up sheets were circulated..
Deb Zynormiski thanked Barb Whyte, Bev McLean, Marie Bak, Florence Zynomirski and Marlene Link for providing tonight’s delicious refreshments. Deb Z requested volunteers for April’s program. Thank you to Beth Powell, Jenny Elgersma, Susan Milligan, Sandra Gill and Joan King for volunteering. 7:20 Break was called for 10 minutes, giving everyone time to grab refreshments, and final opportunity for draws and book auction. 7:30 called to order. VP Deb Zynomirski introduced Adam Chamberlin, Project Manager Forestry for Haldimand County. Adam gave an overview of the tree canopy within Haldimand County. He discussed current tree health, importance of diversification going forward, the devastating effects such as the ash trees, the current high component of Maples within Haldimand towns in need of trimming and removing.They have currently documented 13,674 trees as of March 7th within Haldimand streetscapes and noted 80% of trees in good health. The hope is that all of Haldimand’s parks, cemeteries and public lands will be documented. So going forward Haldimand will have a maintenance program in place for the trimming, cutting, replanting of appropriate species with an emphasis on native trees to ensure a strong healthy diversified canopy, providing health benefits, aesthetics and cost effective management. A new memorial tree planting program will be available, contact Adam. 905 318 5932 ext 6512 achamberlin@haldimandcounty.on.ca Q&A followed. Following Adam, Pres Debbie Thomas introduced DHS newest member Dan Mckay who will be leading DHS newest project for 2018. Dan gave an overview of his involvement with the Thompson Creek revitalization project that began in the 80’s along with plans to continue and complete some of the items that had been on the wish list. Dan will be working closely with Adam Chamberlin identifying the Carolinian trees previously planted. DHS plans to have markers attached with QR codes, and establish paths throughout the Carolinian forest along both sides of Thompson creek and through the tall grass area. This will provide the public with a natural educational setting to walk and enjoy. This is a continuation of last year’s successful partnership with Hald County that saw improvements made to Centennial Park. Improvements included pathways linking Lions Park and Centennial Park, infrastructure improvements and accessibility to the bridge over Thompson Creek which benefitted everyone. Dan will provide DHS membership with updates as project progresses. Q&A followed. Next up, DHS member Nick Huitema made a surprise announcement. He acquired some very special tomato seeds that had been in space. A small quantity of seeds were given to 3 DHS members Beth Powell, Lester Fretz and Jan Loots. They have been asked to nurture & grow these very special seeds along with using a very special blend of nutrients and report back to our group on the progress. Maybe even a taste test? Early bird draw was tabled till April, draw will include memberships purchased by March 15. Silent Auction book winners were called, everyone thanked for participating. Closing remarks included how DHS gets information out through website, emails, Facebook, bulletin board and acknowledged Tamara Botting from the Sachem for coming out tonight. The important role our local papers play, in helping us to get information out to public. DHS member Sandi Marr writes a monthly gardening column in the Sachem. DHS member Lester Fretz has a monthly gardening column in the Haldimand Press and DHS Pres. Debbie Thomas has a monthly DHS Hort Udate in the Haldimand Press. Everyone thanked for coming out and asked to please come again, always welcome. April’s speaker is Jim Lounsbury of Vineland Nurseries, presenting on “The Art of Pruning”. Debbie opened the meeting at 7:03 welcoming everyone. 1. 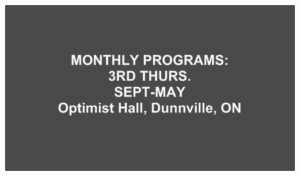 Debbie announced the new Optimist hall sound system recently installed.. A $500 donation from the Dunnville Horticulture Society helped with the purchase. Everything should work and sound better, no more loose wires. Thanks to the Optimist club for doing this. 2. A reminder to please keep your email address updated as DHS Treas. Kim Christoff regularly sends monthly updates, meeting minutes, news or coming events not to be missed. 4. Haldimand County has hired an Arborist, Adam Chamberlin, who is working on improving the tree canopy of Haldimand County. As well we have a new member Dan McKay, who is heading up our newest project. With these two knowledgeable gentlemen, our club has great plans to extend last year’s project at Centennial Park into the Thompson Creek wetlands, and Carolinian forested area. March program details to be announced. 5. Please sign up on our volunteer sheets such as:, The weeding crew (18 beds), Planting Day, Lions Home and Garden Show, Plant Sale, Judges for the fall flower show, Decorating town flower pots, Garden clean up. Volunteers greatly appreciated by board. 6. Deb Z spoke about challenging yourself to sign up for a volunteer position such as a summer weeder. Making the volunteering a social activity with a friend makes it more fun. 7. Thank you to Ellen Gunther, who has offered to collect all the recycled items at each program night and take it home to recycle. 8. Thank you to Ellen Gunther, Angela Lathen, Bev and Wray McLean, Marilyn Stavinga and Denise’s mother, for providing the delicious snacks for tonight. Thank you to Florence Zynomirski, Barb Whyte, Bev McLean and Marie Bak for volunteering for March. 9. Debbie reminded us that we need to always sign in every program night. This list is used if there is an emergency, but also it is used to give door prizes away during the night. 10. Debbie and Deb attended the recent Chamber of Commerce AGM and announced that Lorn Boyko was nominated as citizen of the year. Also that Dunnville Hort. is always recognized at events for our community activities and told our service is appreciated. 11. Debbie announced the break for snacks and purchasing ways and means tickets. At 7:35 Deb introduced Kim Dickie, floral designer. Kim is a DHS member, a flower arranger and floral teacher. Her experience had earned her a position teaching flower arranging at Mohawk College for 15 years. The members enjoyed a lovely lesson on how to arrange many styles of floral arrangements. A question and answer session followed with some fantastic ideas and advise. Deb thanked Kim for her informative talk, and her generous donation of two beautiful arrangements. Steve Elgersma and Marilyn Sutor were the happy winners of the draw. 14. John Wilson donated a beautiful basket of goodies, prize winner was Angela Latham. 15. Debbie closed the meeting with a reminder of the next meeting. Please mark it on your calendar as it should prove to be a very interesting night. 16. Meeting was adjourned at 8:25 pm. 17. Ways and means followed. DHS President, Debbie Thomas, opened the meeting at 7pm by welcoming everyone. · Anyone interested in attending the Orchid Society show, limited coupons to the show available tonight. · Tonight’s refreshment were provided by Denise, Gloria, Nelly and Petra.
. Volunteers needed for 6 more program nights. Sign up sheet circulated. Min 4-5 people needed each program. Gloria will remind volunteers that sign up the week before. 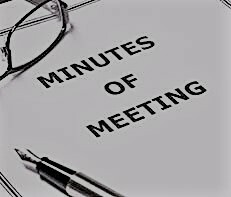 · Treasurer’s report posted back wall and October’s minutes are on the back of the agenda tonight, as last program in Nov was AGM. · Sad to announce the passing of Karen Waltham, a life member of DHS joined 1975. Served a Pres 2007,2008, 2009. Unfortunately no details are available. 1. Lindsay Stevens the Community Outreach Coordinator from the Haldimand Public Library. · Her job is to speak to local organizations as well as plan activities and programs within the county at various libraries. · Spoke about the books and resources about home and gardening in the library. Any book in any library in Ontario is available through an interlibrary loan system. · Space within the library is available for the community to use if they require a space to gather. · Scobia bacteria in a sweet tea, transforms the tea into a low calorie fizzy beverage loaded with many health benefits similar to apple cider vinegar. · A Scobie forms a jelly/rubbery layer on the top of the tea, which protects the bacteria in the tea within from outside elements. · Kombucha has been around for thousands of years. There is no concern about health concerns or illness due to consuming it. · See the website called ‘Kitch’n’ for more information. 3. Lester Fretz, a home gardener and DHS member, speaking on recycling in the garden. · Pails: use them for balcony gardening (potatoes), cut them into rings for use at the base of roses to protect from winter freezing. · Egg shells: reduce blossom end rot on tomatoes when crushed and sprinkles at the base of each plant. · Tin cans: cut bottoms out of several tin cans, glue one on top of another other and use them to grow slips that need long stems. · Clear juice containers: cut bottoms off and use them as mini green houses over your April planted young plants. · Free Slats from lumber yards: use them as into stakes in your garden. · Plastic covers from bank books make perfect plastic sleeves for seed labels in your garden. · Plastic take out containers with solid bottoms and clear tops make perfect mini green houses. · Brown bags with clear windows cut in smaller sections, staples on the bottom, make great storage for bulbs. · Large paper bags make for great storage for cana bulbs or other bulbs that require dark space. · Clear dry cleaner bags, great for protecting outdoor plants from wind. · Over sized t-shirts make great filters for water. 4. Question and answer session followed with questions directed to the three guest speakers. · Please visit our newly renovated library and enjoy all it has to offer. · During our yearly plant sale, if anyone would like to start some vegetables to donate them to our sale that would be appreciated. · 50 people signed in tonight, everyone is welcome to 2 bunches of beautiful tulips brought in by Kim Christoff donated from Niagara Tulips. · Next month guest speaker, Kim Dickie is doing a talk on flower arranging. · Members were welcomed to help themselves to freebies from Lester’s recycling talk as well as Gloria’s Kombucha samples, and ask Lindsay more questions about the Local Libraries. · Ways and Means draws took place. Our October program night began with a full house of 98 members and guests. Debbie Thomas warmly welcomed everyone, especially our Junior Gardeners and 4H guests including Haldimand County 4H President Isoble Miller and 4H leaders Wendy Strong, Gwen Schauffner, Reta Vandervliet. Morgan Schaeffer (4H Jr. Gardeners President) led the 4H pledge. Updates: -Centennial Park & Fountain Rededication, Sept. 23: appreciation was expressed to DHS Board & Executive, DHS members, community volunteers and all who made this event and work leading up to it a huge success. Special recognition of Debbie Thomas and Katrina Schmitz (Haldimand County) was made. -Tree Canada/Grand Erie Home Hardware & Building Centre grant: DHS 2017 recipient. Debbie provided an update on the tree plantings: 7 trees planted in all, 2 Honey Locusts, 2 Ginko, 2 London Plane, I white spruce. 3 trees went to Kinsmen Park, 3 to Central Park, 1 to new Waterfront Park. Central Park was the humble beginning of DHS. The Norway Maples surrounding the park and weaving the paths were planted by DHS more than 88 years ago and sadly some are marked to come down. -DHS Board of Directors 2018: joining will be Nelly Engelage, Lynn Loney, Ian Steele. -DHS/DCS: honoured with the Haldimand County Canada 150 Project Award. New Business: -9-11am, Oct. 21 Fall cleanup. Meet at the bridge parking lot. Mike Lessard of “Jeff’s Outdoor” will join us with his trailer for hauling our plant debris. -Jr. Gardeners were recognized by Margaret Bottrell for their excellent season of gardening. The following awards were presented: 1st place garden Mackenzie Caddick, 2nd place garden Lilianna Peirson, Harley Lynn Atkinson, 3rd place garden Landon Lucas, Christina Lucas, Aiden Lucas. The Judy Jeffrey outstanding achievement award for 2017 went to Harley Lynn Atkinson. Refreshment break was announced with appreciation to 4H for providing snacks. Kitchen tips and snack donations were $61.70. Our guest speaker, Lester Fretz was introduced. Lester is a 6th year returning favourite DHS speaker. He shared an informative power point on “Gardening with Raised Beds” and engaged everyone in a hearty question period following his talk. Lester concluded his presentation by giving out 14 containers of fertilizer to lucky recipients. -Feel free to pass your year-end suggestions along to Debbie T. or Deb Z. or place in the suggestion box provided on program nights. There will be no survey this year. -Visit your local garden centres for end of season sales. -Gather and save your seeds for next year. -6pm, Nov. 16: AGM, Christmas Potluck, 4-Seasons Garden Photo Contest, Raffle table (no Ways & Means) & our Food Drive for the Salvation Army. -Ways and Means winners were also called and everyone was dismissed. 68 people signed in as we resumed our program night after the summer break. Debbie Thomas warmly welcomed guests and members to the evening. -Sept. 30: District 9 Fall Forum, Roselawn Centre, 296 Fielden Ave., Port Colborne. Poster at back with full details as well as on our website. -Oct. 4, 12:30pm: Central Park Tree Planting Ceremony. All welcome to attend. -Oct. 19: Next program night with Fun fall flower & vegetable show, 4H/Jr. Gardener awards night. Forms distributed and on our website. Come early with items. -Nominations open for 2018 Board of Directors. Stepping down: Mary Lou Johnson, Betty Ballanger, Rob & Sandi Marr. Please consider these board openings. -Sept. 23: Centennial Park & Fountain Project Rededication. Volunteers needed to help with parking & childrens’ activities. Show your DHS pride and support by attending this great, family event. -On behalf of the Chamber of Commerce, Don Zynomirski commended DHS for our hard work. He highlighted Sept. 30 concert/supper sponsored by the Optimist Club. Refreshment break was announced. Tonight’s refreshment volunteers were thanked: Keith & Marie Bak, Bev & Wray McLean, Beth Powell, Sandra Gill, and Lorraine Stevenson. October refreshments will be provided by the 4H Club. Our guest, David Culp was introduced. David shared his passion for “Bonsai” and sparked our interest with his knowledgeable presentation. Time was allowed for questions and answers. David donated two Bonsai books which were won by Sandra Gill and Kim Christoff. He also brought some of his bonsai plants for display. Kitchen & refreshment donations were: $50.50. Thanks to all who contributed. Everyone was dismissed with a grateful appreciation to all who made this evening an enjoyable time. A record of over 125 people signed in for our May program night. Debbie Thomas welcomed guests and members to our special evening with Artist Christian Corbet and his protege, Lukas France who refurbished of our Centennial Park Monument. Guests Margaret Kamping, Rob Shirton, and Katrina Schmitz were also recognized. Thanks to Brant Richardson (former DSS student volunteer and son of Denise Richardson, DHS Board member) for designing 2 metal garden trellises for donation to DHS. One will be auctioned at the upcoming Mayor’s Gala, May 27. $5 donations are accepted tonight for a chance to take home the second garden trellis at a draw at the end of this evening’s program. Our regular speaker, Jim Lounsbery, “The Art of Pruning” will be rescheduled due to the timing of Christian’s visit. Tonight’s program is a celebration of Centennial Park Monument and the history of Artist Dr. Elizabeth Holbrook. -Plant Sale, May 13 raising $1809 (plant sales), $170 (bird house draw), $1250 (donation). 8 new members and 16 junior gardeners joined our club. Remaining plants were donated to Thompson Creek Community Garden. Thanks to all who volunteered their time and contributed their plants. -Lions Home and Garden Show, April 21-22: 66 new members joined. Prize winners: Helena Collins and Marianne Knight. -Planting Day, May 27, 8am: meet at the parking lot by the bridge with your gloves and hand trowels. Volunteers are welcome as we have over 200 trays of annuals and 50 grasses to be planted. “Many hands make light work.” Thanks to Konkle Greenhouses for their generous donations. -Mayor’s Gala, Cayuga, May 27: tickets available $125/person. Call (905) 318-5932 ex. 6102 for tickets. DHS is a recipient of this fundraising event this year! -Mark Cullen, Speaker, June 15, GrandErie Garden Centre: our regular program night will join this great event. Tickets must be purchased in advance at GrandErie Garden Centre. $5/person includes entry into draws, raffles, and refreshments. Proceeds donated to DHS. -Haldimand Motors Great Trike Race, Sept. 8: DHS will be participating. If you wish to help, contact Deb Z. or Debbie T.
-Visit our website www.dunnvillehortandgardenclub.org for summer updates. Kim C. will send out email updates as well. Break was announced. Tonight’s refreshment volunteers were thanked: Joan King, Sharon Sykes, Evelyn Wardell, Lisa Burden & Kathy Black. September refreshments will be provided by: Marie Bak, Bev & Wray McLean, Beth Powell, Sandra Gill, and Lorraine Stevenson. Our garden trellis was won by Woody and Joan King with $300. raised toward the Monument restoration project. Deb Z. had the privilege of introducing our guest, Christian Corbet who shared many interesting stories about the life and work of artist, Dr. Elizabeth Holbrook. Christian was Holbrook’s sole protege. Slides and actual art pieces enriched his engaging presentation with time for questions. Christian also provided an overview of his work the past 8 days on the restoration process of the Centennial Park Monument. The presentation ended in a standing ovation with thanks for Christian’s work along with his protege, Lukas France. “Auctioneer” Don Zynomirski led a live auction of original watercolour artwork donated by Christian. He chose to paint geraniums since this is our club’s official flower. Original pieces were purchased by: Marilyn Stavinga, Don Davis, Denise Richardson, Kim Christoff, and Deb Zynomirski raising a total of $615 toward the Monument restoration project. Thanks to Christian for his generous donations, to those who made art purchases, and to Don Zynomirski, our auctioneer. Our Annual May Rose Draw concluded this great evening with 10 winners: Peter Zynomirski, Nelly Engelage, Woody King, Donna Cavers, Keith Bak, Lynda High, Rose Marie Bosak, Svetlana Poltavets, Tina Janssen, and Boukje Dykstra. Kitchen & Refreshment donations were: $69. Thanks to all who contributed. 67 people signed in for our April program night. Debbie Thomas welcomed visitors and regular attendees. Housekeeping details were highlighted. Updates were provided by Debbie Thomas, Sandi Marr, and Deb Zynomirski. Our DHS brochure has been updated with changes to June and October events. Our June program night will be held at GrandErie Garden Centre featuring Mark Cullen, speaker. GrandErie Garden Centre is donating monies received that evening back to DHS. Our website (www.dunnvillehortandgardenclub.org) and Facebook page provide valuable information including a new “GIVING” feature for charitable donations on our website. In the last 20 days, we had close to 1300 visits on our website. Be sure to visit us on social media. Upcoming is our Annual Dunnville Lions Home, Garden, and Craft Show held on April 21-22. Thanks to our volunteers and presenters. This is always a great time to meet people, promote our wonderful club, and welcome new memberships. Mini-demos will be offered by Marlene Link, Lester Fretz, and Sandi Marr. Centennial Park Fountain (CPF) kick-off update: April 29, 11am-1pm. Meet and greet community project partners. We are moving ahead with this exciting initiative. All ongoing fundraising goes to this project. Plant Sale, May 13, 7am-noon, at 111 Broad St. E. Plant donations are invited May 12, evening, at same location. Garden art items along with plants are welcome but no magazines or books. Recycled pots are available after our program (outside entrance to our Optimist Hall.) Thanks to all who are preparing plant donations for out biggest yearly fundraiser. Membership discounts are available at various garden centres. Please take your membership card with you when you shop. Sponsors are listed on our website. All paid up members and new members will receive a coupon for garden gloves from GrandErie Garden Centre (Home Hardware) instead of membership discounts for this year. GrandErie will be giving DHS discount on purchases and holding fundraiser events/giving donations to DHS. Ticket price includes garden tours and light snacks at the Garden Gallery. Sponsored by Senior Support Services (905)774-3005. Haldimand Press newspaper subscriptions will be available at breaktime and ongoing. This is a beneficial fundraiser for DHS. Tonight’s refreshment volunteers were thanked: Agnes W., Beth P., Petra K-D., Bev M., & Ellen. Refreshments for May’s program night will be provided by: Joan K., Sharon, Evelyn, & Kathy. Thanks to everyone who helps out. Refreshments are a highlight of our monthly gatherings. Breaktime was announced with time to sign up for volunteering, purchase memberships, Ways & Means tickets, and HP subscriptions (both new subscriptions and renewals can be done through DHS). Deb introduced guest Jeff Ronhaar, from Jeff’s Lawn Care, Binbrook. Mike Lessard was also welcomed. Jeff shared his passion for the outdoors and presented an informative overview of quality lawn care with time for questions and answers. Closing remarks were offered with an invitation to observe Earth Day, Sat. April 22. Ways & Means winners were announced by Betty Ballanger and Gwen VanNatter raising $65.00. Thanks to all who brought recycled items. Kitchen donations were $63.15. 10 DHS memberships were sold. 3 subscriptions to the Haldimand Press were sold. A $200. donation from Velma Shirton was received. $6.20 was donated from Gwen V. (picking up bottles from the gardens). Everyone was dismissed with a grateful thanks to all who made this evening an enjoyable time. Our next program night is May 18 with guest speaker Christian Corbet, artist. Christian is restoring the friezes at Centennial Park Fountain. He will talk about his mentor Dr. Elizabeth Holbrook. 63 people signed in for our March program night. Debbie Thomas welcomed visitors and regular attendees. Housekeeping details were highlighted. Thanks was expressed to the Optimist Club volunteers and DHS Board of Directors for painting our meeting area. Updates were provided by Debbie Thomas and Deb Zynomirski. The back wall displays our monthly Treasurer’s Report, Sponsor/Donor List, Program Minutes, and District 9 Events. Minutes are printed on the back of our Agendas as well as emailed (blind copied) to members by Kim Christoff, Treasurer. Members’ email addresses are not shared with other parties. Mayor’s Gala, May 27 is an opportunity for DHS to receive approx. $10,000. Volunteers are needed to help with this gala event. We are welcome to attend the event, as well. Centennial Park Fountain (CPF) update: fundraising initiatives and planned activities include April 29 Kick-off CPark, Sept. 23 CPF Rededication. Deposits have been made for contracted work. We are moving ahead with this exciting initiative! Thanks was expressed to Debbie Thomas for all of her work with our largest DHS undertaking thus far. This restoration project is estimated to cost close to $29,000. Our new partnership with the 4-H Club has led to 11 new junior gardeners from 4-H. They will help with our planting and clean up days, as well as participate in other planned activities. 2017 volunteer opportunities were highlighted with an invitation to sign up with Debbie and Deb during breaktime. There are opportunities for those who may not be able to “get down on their hands and knees” to volunteer in other ways with DHS. Everyone’s help is appreciated. Deb Z. announced our new fundraising venture with Haldimand Press (HP). Members of DHS are invited to subscribe to HP who will in turn make a donation back to DHS. For example, 1YR costs $55/$10. back to DHS, 2YR. costs $108/$17.50 back to DHS; 3YR costs $156/$30.back to DHS. This is a great local newspaper and DHS members, Lester Fretz and Marlene Link are contributors to this newspaper. Consider a new subscription or a renewal. You may talk to Deb Z. or Debbie T. to support this “win/win” venture with HP. Tonight’s refreshment volunteers were thanked: Lorraine S., Sherry S., Denise R., Alicia & Marilyn S., and Gloria H. Refreshment volunteers for April’s program night were invited. Refreshments are a highlight of our monthly gatherings. Thanks to everyone who helps out. Thanks was expressed to our excellent Board of Directors who work hard together behind the scenes and in between program nights. Breaktime was announced with time to sign up for volunteering, purchase memberships, Ways & Means tickets, and HP subscriptions. Closing remarks were offered. Ways & Means were announced by Betty Ballanger and Gwen VanNatter raising $59.00. Thanks to all who brought recycled items. Kitchen donations were $43.90. 6 DHS memberships were sold and 2 Haldimand Press memberships were sold. Everyone was dismissed. Thanks to all who volunteered to make tonight’s evening an enjoyable time. Our next program is April 20.